"Sergeant, I Hope You Like Vodka"
After America’s military and foreign policy elite make the obligatory wave off of a new Cold War with Russia, or more specifically with Putinism, they will usually admit that Russian behavior since January 2014 when they lied about the seizure of Crimea constitutes a profound, relentless strategy of aggression against the West and especially the U.S.
Hillary Clinton hoped the historic nature of her candidacy would propel an extra high turnout of women who would vote for her at extra high margins. That strategy appeared to be well-conceived as the statements of Donald Trump, especially in the Access Hollywood tape, and accusations from numerous women of his past behavior generated massive coverage and criticism. And, indeed, there was a historic gender gap between the preference of men and women voters (24 points). But, the gender difference was a wash as she won women by 12 points, but lost men by the same percentage. In fact, her 12-point advantage over Trump was not much better than Barack Obama’s in the 2012 election (11 points over Mitt Romney). Nor was turnout higher than 2012. Also, she lost white women by 10 points according to the exit poll. The poll confirms the significant difference the level of education makes. White women with degrees favored Clinton by 7 points, but she lost non-college graduates to Trump by 28 points. The real gender advantage was with Trump. He won white men by 32 points, white men with college degrees by 15 points and white male non-college graduates by 49 points. 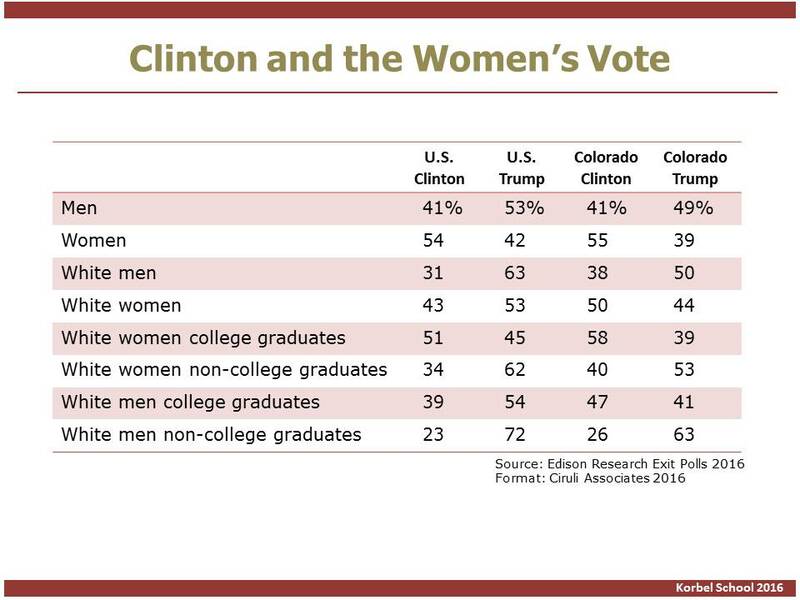 In each category, Clinton did better in Colorado. She won women by 16 points and only lost men by 8 points, providing a net positive gender difference for her of 8 points. Also, she won white women by 6 points and only lost white men by 12 points. 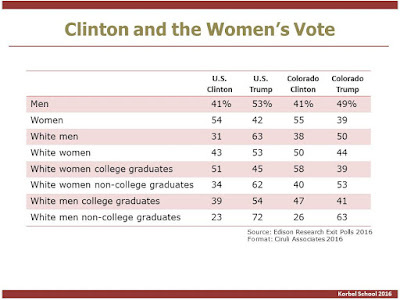 Although the trends were similar to the national data, across-the-board she did better in Colorado and he did worse. Ed Perlmutter, who seldom generates headlines, breaks ideological ranks or battles his party leadership, has just taken on the most powerful woman leader in the Democratic Party – Nancy Pelosi. 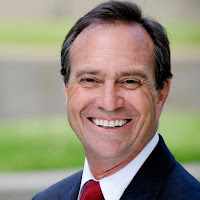 Although it is unlikely Perlmutter’s candidate for minority leader, Tim Ryan (46 years old, Ohio), will beat Pelosi, the entire House Democratic leadership team is near the end of its run (Pelosi ‘76, Steny Hoyer ‘77, and Jim Clyburn ’76). Pelosi and her team have led House Democrats through four elections where they have failed to win a majority. Her current rationale for leading the fifth effort is that it will be like 2006 during George W. Bush’s second midterm election when Democrats won 30 seats and made her Speaker. 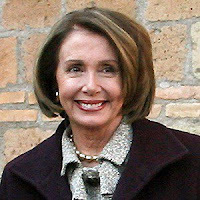 Another scenario she doesn’t’ use is in 2010 when her leadership of the House with Barack Obama as a first term president led to a 63-seat Democratic loss and replaced her as Speaker with John Boehner. It is possible Donald Trump could make a mess of his first two years, but it seems arguable. Ms. Pelosi will make much of a contribution to causing his problems or exploiting them for the Democrats. She has become a high-profile defender of the Democratic Party establishment and D.C. status quo. Also read The Buzz: Pelosi Retires? An extraordinary election. The female candidate gets more votes than her male opponent and more votes (63.6 million and still counting) than any candidate in history except Barack Obama, but loses the presidency. She lost a series of swing states in the rust belt by mostly small margins and the electoral vote 232 to 306 (when Michigan is declared, which she lost by about 11,000 votes). 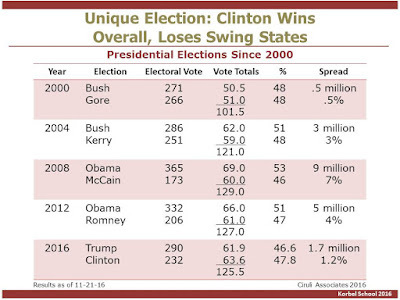 Although counting is continuing, mostly in three of the West Coast states, which she will win by 60 percent or so, Hillary Clinton is now more than a million votes ahead (1.7 million on 11-21-16), more than any candidate in history among those who won the popular vote and lost the electoral vote. Al Gore was ahead by about 543,000 of George W. Bush in 2000. About 7 million votes went to third-party candidates in this election, exceeding Ralph Nader’s total in 2000 (2.9 million). Turnout in general was about equal to the Obama election of 2012, but below 2008. 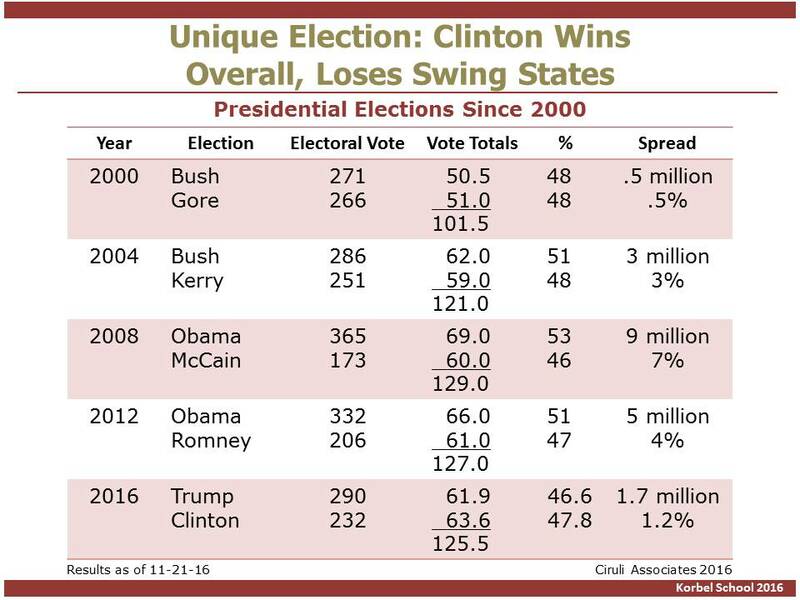 Part of Clinton’s problem was that turnout was lower in those competitive swing states she lost. Many Obama voters simply did not turn out. Washington Post: Why did Trump win? In part because voter turnout plunged. 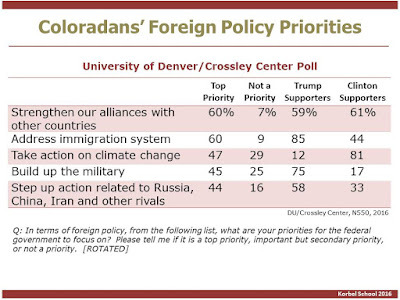 In a pre-election statewide survey, Colorado voters were asked their priorities in terms of foreign policy. 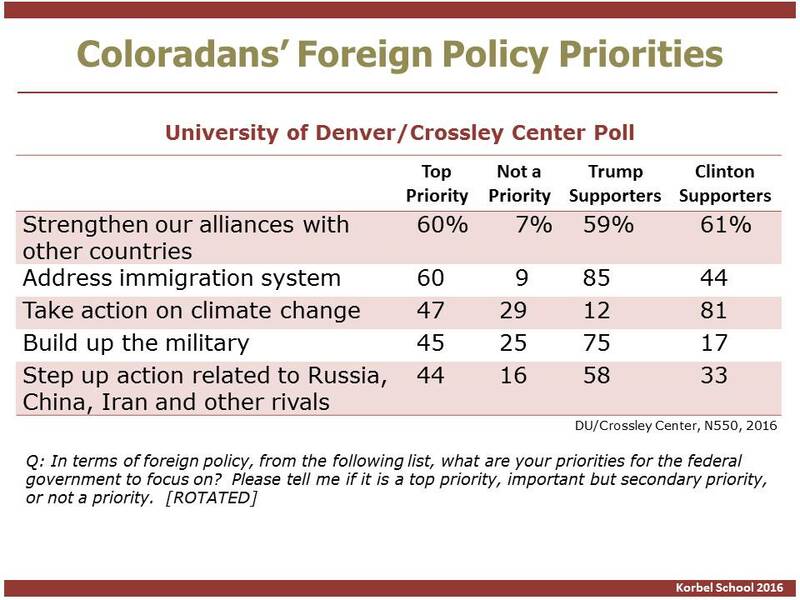 “Strengthen our alliances with other countries” (60% top priority) and “address the immigration system” (60%) were tied for their top priority in the University of Denver/Crossley Center survey conducted in late October. Clustered in a secondary position among the five issues tested were climate change (47%), a military build-up (45%) and “action” related to rivals, such as Russia, China and Iran (44%). There were some dramatic differences among Donald Trump and Hillary Clinton supporters that will be relevant given the president-elect’s preferences and administration team now being assembled. For example, Trump supporters strongly want to build up the military (75%), but it was a non-priority item for Clinton supporters (17%). The reverse was true on climate change. Clinton supporters made it their top priority (81%), but it was a non-priority for Trump voters (12%). Both camps want to strengthen the alliance system, but Trump supporters are interested in being more active with rivals, including Russia, than Clinton supporters. In both of these areas, Trump is somewhat out of step with his base. The question on immigration was worded in a neutral fashion. It asked the priority preference for “addressing” the system. It was the top priority for Trump supporters (85%), but of less interest for Clinton supporters (44%), which was possibly a reflection of the difference in preferred solutions; i.e., “wall and deportation” vs. “path to citizenship.” Trump supporters expect and want something done whereas Clinton supporters rate it a lesser priority and are concerned as to what that solution will be. 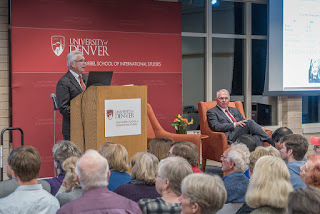 The University of Denver/Crossley Center for Public Opinion Research survey was conducted by live interview telephone calls with 550 likely Colorado voters. The survey was in field from October 29-31, 2016 by Floyd Ciruli, Director of the Crossley Center. The sample was selected by random probability design from a list of registered voters from the Colorado Secretary of State and included 258 landlines and 286 cell phone respondents. The data was weighted based on likely voter statistics for age and ethnicity. 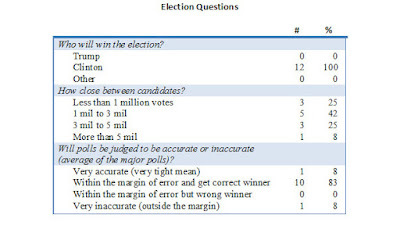 Overall, the survey’s margin of error is plus or minus 4.2 percentage points. The margin of error for subgroups is larger. Jefferson County’s educational establishment was surprised and dismayed at the loss of its hefty school bond and revenue initiatives when numerous neighboring districts approved approximately $4 billion in new revenue in the November election. They needn’t look much farther than the coup d’état that removed three board members last fall and shifted the board control to the teachers union and their community allies. Children will suffer from the school district’s failure to sell their proposal, but so will the teachers who would have benefited from the mill levy override, and maybe that’s what some taxpayers thought a just result. 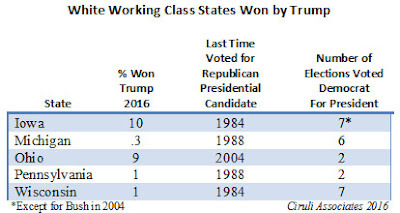 One of the big stories of the 2016 election is the Democrats’ loss of the white working class in the rust belt that has voted for Democratic presidential candidates for two decades or more. Donald Trump won close races with the white working class support in Pennsylvania, Michigan and Wisconsin. He won bigger majorities in Ohio and Iowa. Colorado is not a working class state, and Trump lost the state by a narrow margin. But, he did well with white voters without a four-year college education. 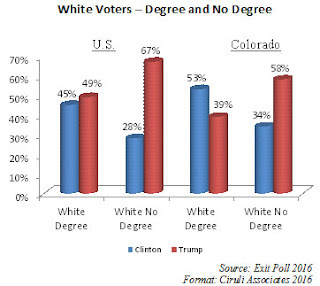 Nationally, he carried 67 percent of non-college educated whites and won degree holding whites by 4 points. In Colorado, he carried non-degree holding whites by 58 percent to Hillary Clinton’s 34 percent. But, she carried college degree holders by 14 points. The national and Colorado differences help explain his Colorado loss. Pueblo may be Colorado’s largest blue collar working class county, with both an Anglo and Hispanic population. As of November 17, Trump is neck-to-neck with Clinton. cycles. I assumed she would not run for leader when Democrats lost a disastrous 63 seats in 2010 and she was removed as speaker. Wrong – she ran and won as minority leader. She then led the House Democrats through three more elections, each time losing seats or winning far too few to put Democrats in control and her back in the speakership. With 193 seats, Democrats are now back to their 2010 level, and at 239 seats, Republicans only lost six seats this year, they remain near historic high levels of seats (Republicans held 246 in 1946, 247 in 1928 and just had 247 in 2014). Although she is clearly a great counter of votes in her caucus, she is a loser with the general electorate. But, she just doesn’t know when to quit and let a new generation take over. Nancy, it’s time to retire. Interest groups and activists put seven major initiatives on the ballot for voters to decide on in the November 2016 election. More than $50 million was spent on advertising and ground games achieving a 71 percent success rate (5 out of 7 passed). At the end of October, a DU/Crossley Center poll was released that identified the five likely winners and two losers. 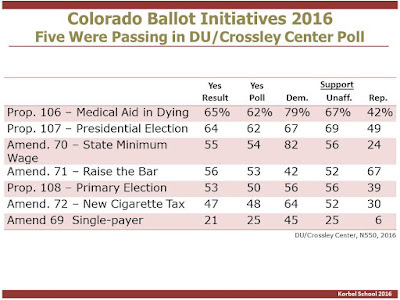 At the top of the list of popular proposals was giving people a right to die under specific circumstances and shifting the Colorado presidential nominating process from a caucus/convention system to a primary in which unaffiliated voters can participate. Members of both parties and unaffiliated voters supported both propositions. The least popular proposal was the single-payer health care initiative placed on the ballot by fans of Democratic presidential candidate, Bernie Sanders. It should serve as a warning concerning the popularity of many solutions that can be labeled expensive and big government. It was never ahead in the polls and could not command a majority of Democrats. More of a surprise was the defeat of the $2.50 cigarette tax measure, which started with more support than opposition in early polls, but faded after a withering advertising campaign ($20 million) questioned where the money collected by the tax would go. 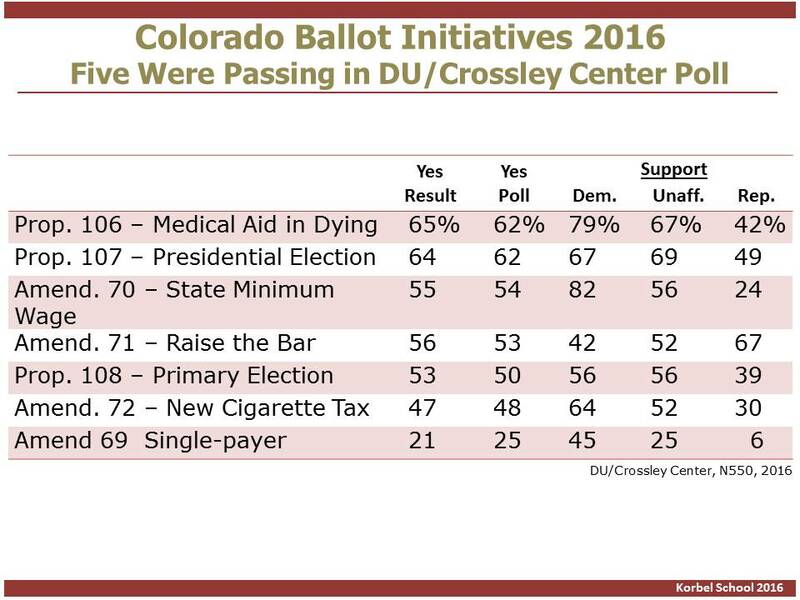 Taxpayer frugality overcame the usual voter support for sin taxes, especially related to cigarettes. Proponents of the minimum wage had resistance from Republicans and had to work hard to get 57 percent support. Typically, minimum wage increases get voter support, and Colorado passed a less expensive version in 2006. The initiative had union and out-of-state support. Two initiatives related to unaffiliated voters and limiting constitutional amendments were less popular and required campaigns to bolster their support. Both were complicated in their intent and effect and had higher levels of undecided voters late in the campaign. The voters of the seven-county Denver metropolitan area gave an overwhelming thumbs up for the renewal of the Scientific and Cultural Facilities District (SCFD). 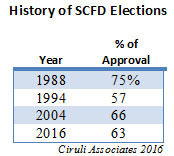 This is the third renewal of the SCFD since its creation by voters in 1988. We thank the voters of the region for their continued support of the district. 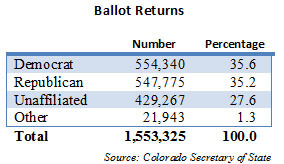 The 63 percent victory was among the highest percentages achieved by statewide ballot issues. The SCFD passed in all seven counties. The SCFD is bipartisan. It carried counties that voted for both Donald Trump and Hillary Clinton. 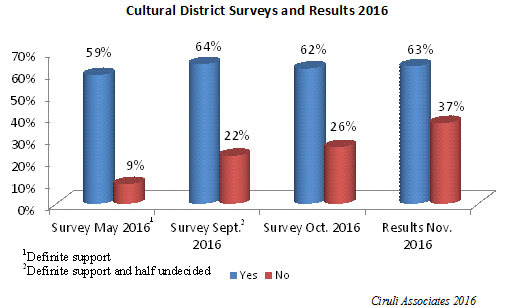 In repeated surveys Ciruli Associates tracked the victory margin. The final survey indicated 62 percent support a week before the election. The campaign, which began in earnest in July 2015, represented hundreds of organizations (248 endorsed) and thousands of volunteers throughout the area. 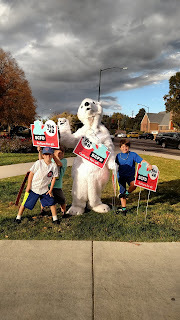 A couple of metrics that stand out are 17,000 yard signs distributed and more than 300 appearances by Popsicle, the campaign mascot. Ciruli Associates helped create the district and has been the general consultant in every renewal since. This year there was a team of top managers and consultants that ran a very strategic, energetic and disciplined campaign. 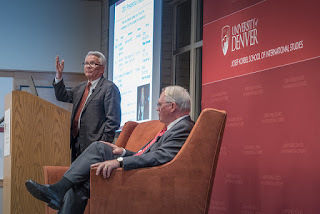 The SCFD represents an extraordinary investment in the culture of the seven-county Denver area. 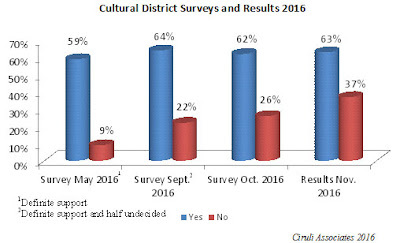 The endorsements of civic leaders and conversations with voters in surveys reinforce the value people place in large and small cultural organizations. 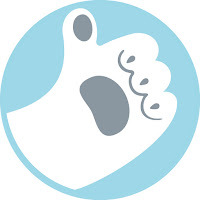 They are especially supportive of the access for children and the funding for high-quality shows, exhibits and programs. Also, the showcasing of the community to the world and the economic benefits are highly appreciated. The organizations now have a dependable funding base until 2030. Thank you all for the help and for voting to renew. 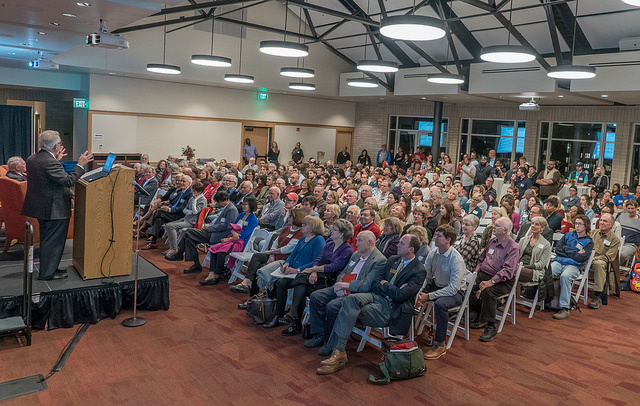 More than 250 attended the post-election event co-sponsored by the Korbel School and the Crossley Center for Public Opinion Research. 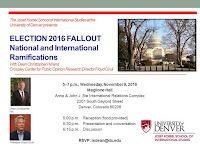 Along with examining what happened on Election Night, including a review of the polling and forecasting, the national and international fallout of the election was discussed. Questions ranged from likely personnel in the new administration (Secretary of State, Defense, etc. ), to the impact of a one-party controlled federal government and the future of Obamacare and immigration policy. 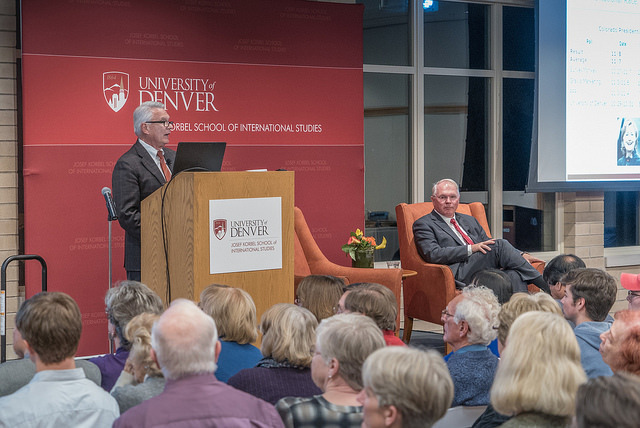 Also, a host of foreign policy issues were reviewed, including Syria, Russia and Eastern Europe. The latest edition of Foreign Affairs features populism as a reoccurring phenomenon now on the move in much of the developed world. Its rise in the U.S. was tied to the political events and personalities in a number of European countries. Another Korbel/Crossley session on the new administration and its politics and personnel is planned after the Inaugural next year. In the recent DU/Crossley Center poll, 53 percent of Colorado voters said no to a question asking if they wanted recreational marijuana sales expanded in Colorado. This does not mean voters are ready to delegalize recreational sales, but a majority says they are opposed to further expansion. 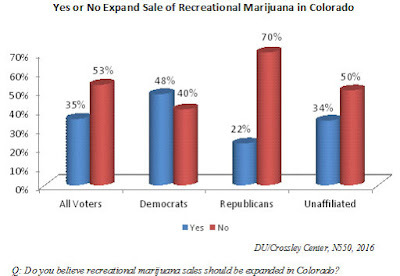 Democrats are the most willing to see recreational marijuana sales expanded. Important votes on recreational marijuana use are taking place in Democratic strongholds of Denver and Pueblo. Colorado voters may have reached their limit on recreational marijuana, according to a new statewide poll that shows 53 percent of likely voters don’t want recreational pot sales expanded, while 35 percent do. That’s not the same question that state voters faced in 2012, when 55 percent voted to legalize recreational marijuana. But this latest survey could be a sign that voters are now viewing pot differently, said pollster Floyd Ciruli, who did the survey of 550 voters over the Halloween weekend. “It’s not the question that Pueblo voters are facing on Nov. 8 — to repeal the licenses of recreational pot businesses — but we may be seeing signs that public support for recreational marijuana has hit its high point,” Ciruli said. “But everyone is watching what happens in Pueblo because of the possible repeal of marijuana licenses,” Ciruli said. Thirty percent of all Colorado voters question the legitimacy of the presidential election. A finding in the DU/Crossley Center poll conducted October 29 to October 31. 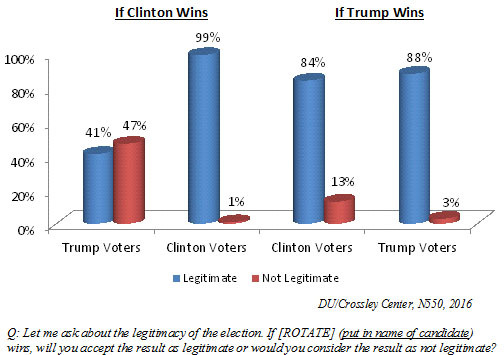 Nearly half (47%) of Donald Trump voters would question the legitimacy of a Hillary Clinton win. Nearly half of Colorado supporters of Republican candidate Donald Trump would consider a victory by Hillary Clinton on Tuesday to be an “illegitimate” election, according to a telephone survey of 550 voters by Ciruli Associates, the well-known Denver polling firm. The telephonic survey was conducted over Halloween weekend for the University of Denver’s Crossley Center for Public Opinion Research. The Colorado Senate seat stopped being considered competitive on primary night, June 28. Darryl Glenn, a Ted Cruz conservative, county commissioner from El Paso County, was generally perceived as too conservative, too inexperienced and too under-resourced to win. The Colorado Republican Party, like the national party, is still having difficulty finding a candidate that will attract its various factions, in particular its establishment. The polling averages give the seat to Democratic incumbent Michael Bennet by 7 points (which is the low end of the estimates). Nationally, the race to control the U.S. Senate is considered a toss-up. Close races are in Nevada, Wisconsin, New Hampshire, North Carolina, Missouri, Pennsylvania and Indiana. 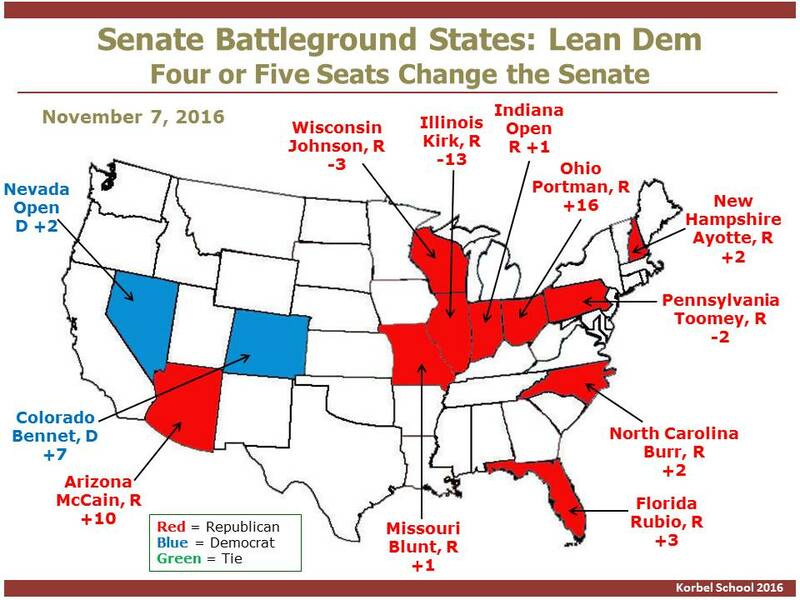 The latest polls have Democrats ahead within the margin of error in four contested seats that could let them take the Senate (with a Democratic vice president), but with the slimmest margin (Nevada, Wisconsin, Illinois and Pennsylvania). But, the advantage is razor-thin and will depend on turnout. The final polling averages have Hillary Clinton winning by at least 3 points and about 300 electoral votes (270 needed for election). That result would be below the Barack Obama victory of 332 and 4 percent in 2012. But, it was expected that Clinton would have difficulty reassembling the Obama coalition in the face of a voter headwind of desired change. Clinton simply ran a stronger campaign against a candidate who injured himself in the primaries and never recovered. Donald Trump won his nomination alienating establishment and mainstream Republicans, along with major groups of voters, particularly minorities, who are key in a number of swing states. The final polls aggregated by 538, Huffington Post and RealClearPolitics show a spread from 3 to 6 percent. The forecasts agree with the aggregators that Clinton wins since near the end of a campaign they are driven mostly by polls. It is projected she will win from near certainty at Princeton Election Consortium (99%) and Huffington Post (98%) to 84 percent at the New York Times Upshot to a low of 72 percent at 538. Colorado is also considered a lock for Clinton, with about a 2 to 5 percent spread. We have been watching 13 states since Labor Day and at least 11 remain competitive (are within margin of error) today. 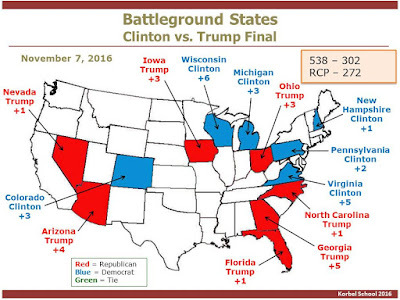 As the map shows, in the West, Trump appears ahead in Arizona and Nevada, but Clinton up in Colorado. 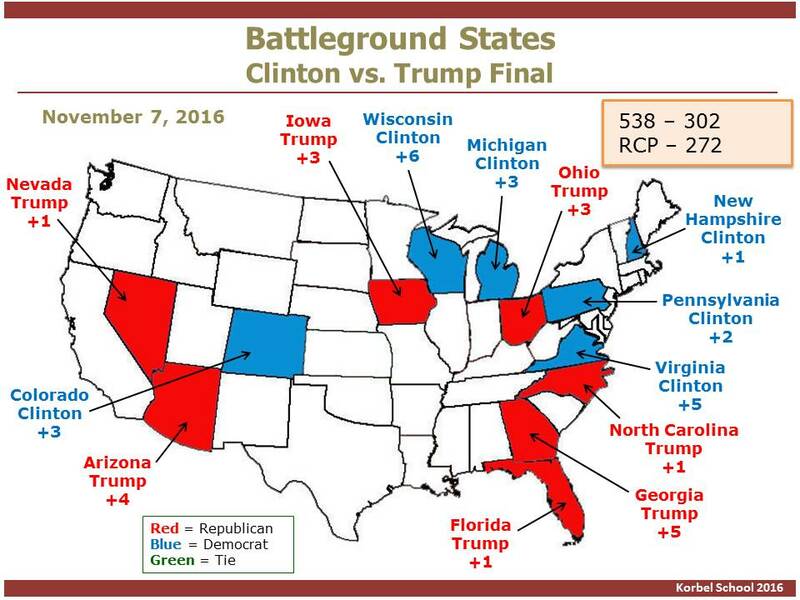 Polls have tightened in most swing states the last week, but Trump’s path to victory is still considered much more challenging than Clinton’s. Also, her organization is built upon, and possibly better than, the Obama Election Day super machine in 2012. FiveThirtyEight refers to electoral vote projection – 302 Clinton. RealClearPolitics projects 272 “no toss-up” Clinton. Either Colorado county clerks and election officials are about to be swamped with ballots or Colorado will have a weak turnout in 2016. The presidential race in 2012 attracted 2.6 million voters and the growth in registration indicated that 2.8 million voters would be participating in 2016. Currently, there are 1.8 million votes cast, so unless a million people turn in ballots in the next 36 hours, this will be a modest turnout. Statewide Democrats and Republicans have turned out in near equal numbers, with a slight Republican edge (Republicans just caught up this weekend). But people don’t necessarily vote their registration. Both major party presidential candidates attract votes from the opposing party. And third-party candidates get most of their votes from the major parties. Democrats dominate the metro area due to margins in Boulder and Denver. Arapahoe and Jefferson simply don’t produce the Republican vote of the last century. 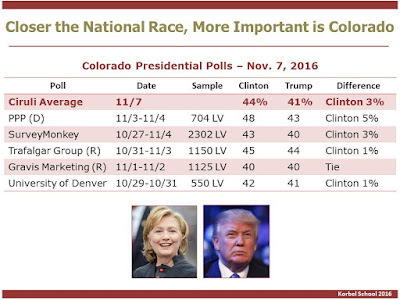 A number of partisan polls have been conducted in Colorado, mostly showing Clinton ahead by 5 points. 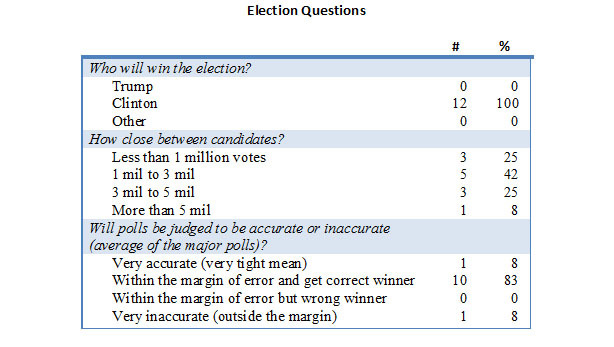 Many are automated polls. Also, there are several polls showing it closer – one point to a tie. The forecasts all expect Hillary Clinton to win in Colorado by somewhat less than Barack Obama’s victory of 5 points in 2016. The vote to renew the Scientific and Cultural District (SCFD) is ending the campaign with maximum voter contacts. Phone bank, door-to-door literature distribution, an active social media and digital campaign, and a highly praised television advertisement are underway. But most visible may be the sign wavers on busy metro area streets, often accompanied by Popsicle, the SCFD polar bear. A group of graduate students in a public opinion and foreign policy class at the Korbel School at DU made their election selection. All of them believe Hillary Clinton will win. The majority believe the vote will be close. Sixty-seven percent believe it will be less than what Romney won by in 2012 (he won by about 4 million votes). One student saw a landslide. And they believe (83%) that major polling averages (i.e., leading aggregators) will get the correct winner and be within the margin of error. One student thought they would be wildly off and one said they would be spot on. In my view, a very reasonable assessment of the status of the polls. November 8 will confirm or correct. The election narrative is locked in. Few new attacks, WikiLeaks, etc. will be covered by the mainstream media. Most people have factored those issues into their decision. The story now is tactics. Are the candidates and parties getting out their supporters? The Democrats are putting their top team into the field to push their voter turnout. Bill Clinton, Bernie Sanders and John Hickenlooper are in action. Democrats have felt confident about Colorado, but recognize the race has tightened and GOTV is essential. Republicans aren’t lacking in effort. Mike Pence made his fifth visit to the Larimer-Weld area on Thursday. As of Thursday night, 1.5 million votes were turned into county clerks and the Secretary of State’s system. In 2012, 2.6 million voted. It was projected that 2.8 million could vote this year due to growth in population and registered voters since 2012. If the estimate is correct, county clerks are going to have a busy final five days processing more than one million ballots that have to be dropped off by Tuesday at 7:00 pm. If voter turnout is below estimate, Donald Trump is the most vulnerable. Hillary Clinton won the early vote, but was struggling with late votes. Trump desperately needs the late vote. The latest turnout report has Republicans catching up to Democrats, but still lagging (7,000 votes) since mail-back voting started on October 19. The Buzz: Will Colorado turnout hit 3 million voters? Dean Christopher Hill and professor and pollster, Floyd Ciruli, will analyze the election results and the effect of politics and policy of the U.S. Were the polls and pundits right? Hits, misses and biggest surprise. Will the new president and Congress beat the gridlock? Will the Republican Party heal? Can the Democrats avoid a split? Is a third or fourth party on the horizon? Is the post-Obama foreign policy more interventionist? Is confrontation likely? What challenge is addressed first? Was the conflict in the American campaign indicative of the future of center-right and center-left governments throughout the West? Will protectionism, isolationism and nativism dominate 2017 politics? Is western democracy in crises? 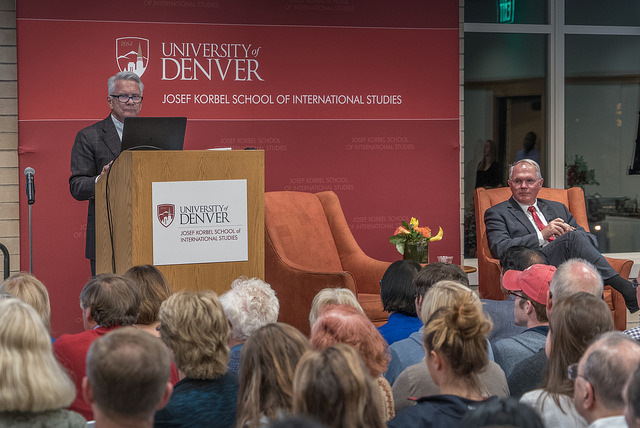 Join the discussion on November 9 at Maglione Hall in the new Sie wing of the Korbel School on the DU campus (2201 S. Gaylord St., Ste 4005) from 5-7 pm. Food provided. 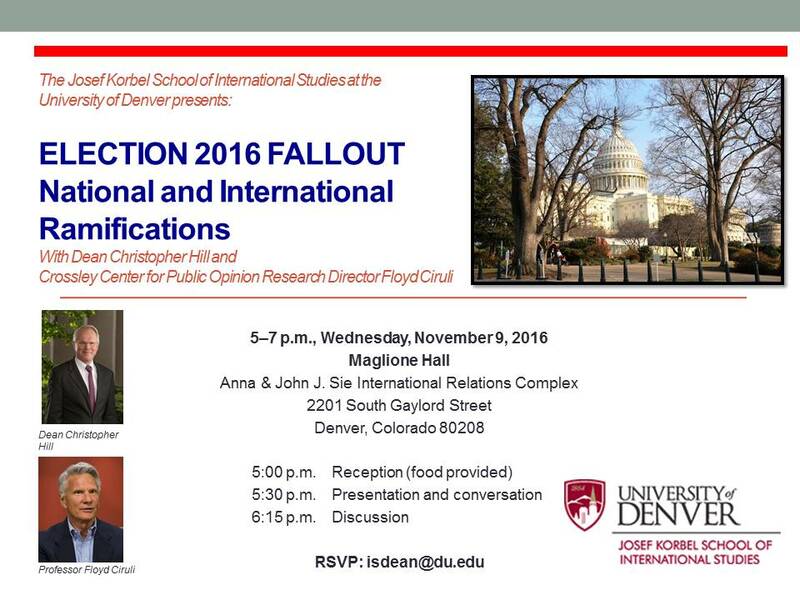 RSVP to isdean@du.edu. In a long, thoughtful editorial, the Pueblo Chieftain recommended voting to end legalized recreational marijuana in Pueblo County. The Chieftain listed the economic benefits, namely jobs and tax revenue, but cited the massive increase in the homeless population, vagrancy, panhandling, parking lot camping and tent cities. They also described the social cost for police protection and emergency room care due to recreational marijuana. Also, “60 Minutes” this weekend featured Pueblo’s marijuana industry with an emphasis on the negative impacts on infants, teenagers and driving while intoxicated. Expansion and taxation of recreational marijuana is on the ballot throughout Colorado this election. Has the spread of recreational marijuana reached a resistance point? Are voters for more or less? Like residents in the Denver metro area, El Paso County voters believe their area is moving in the right direction. 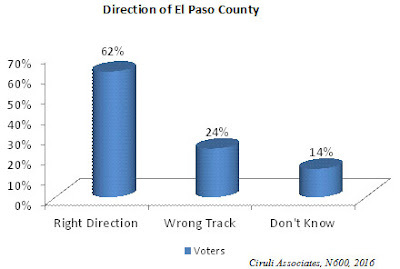 Sixty-two percent of El Paso voters and 60 percent of metro voters see their respective areas moving in the right direction. El Paso voters believe the “most important issue to deal with in next few years” is connected to growth. A near majority (47%) of voters cited growth-related issues, such as traffic congestion (35%), just “too much growth” (9%) or affordable housing (2%) as most important. 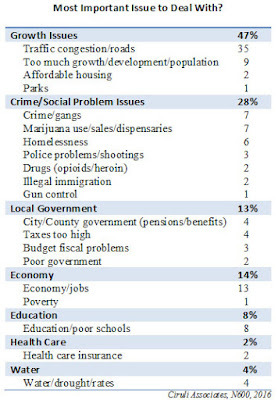 Crime-related issues were in second place (28%), including marijuana use, sales and dispensaries (7%); homelessness (6%); and police problems, shootings (3%). The final larger categories were local government issues, such as pensions and benefits (4%), and high taxes (4%), and the economy and jobs (13%). 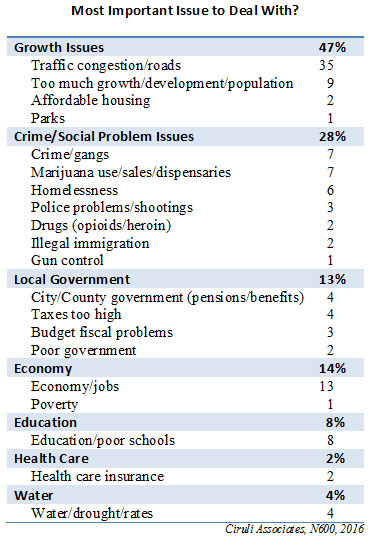 The survey was conducted by Ciruli Associates for the Colorado Springs Gazette with 600 likely voters on October 18. The margin of error was ±4.0 percentage points. 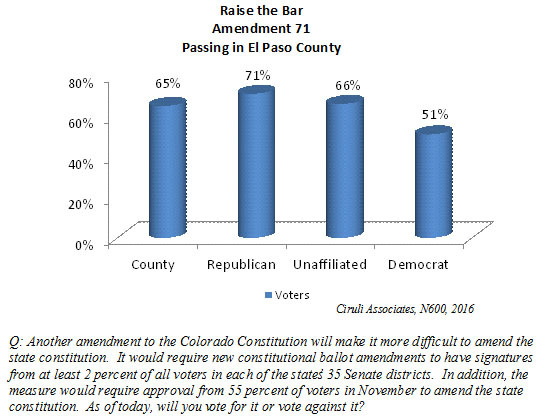 Amendment 71, called Raise the Bar, which will make it much more difficult to amend the state constitution, is passing in El Paso County, with strong support from Republicans. 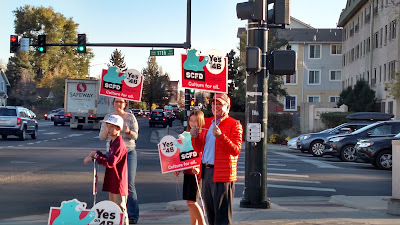 The survey conducted for the Colorado Springs Gazette (600 sample, Oct. 18) shows 65 percent of voters approved Amendment 71, with 71 percent of Republicans, but only 51 percent of Democrats in support. 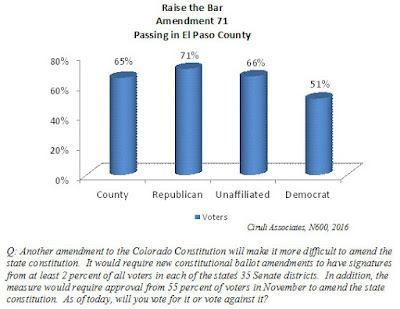 When joined with the 53 percent overall support in the Denver metro area (late September poll), Raise the Bar appears to have sufficient support to pass statewide. By a 3-to-1 margin, those surveyed said they would vote for a constitutional amendment making it harder to amend the state constitution. 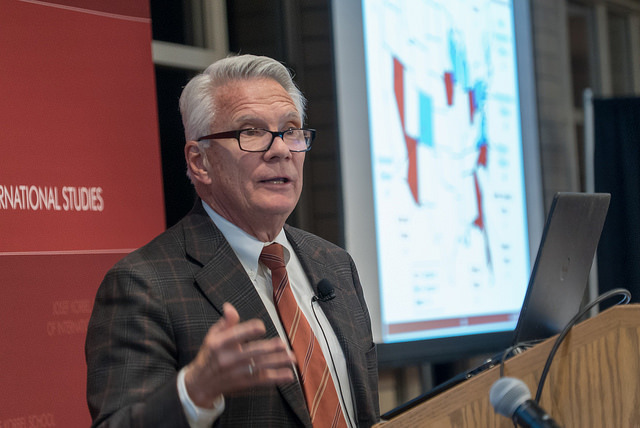 The campaign for Amendment 71, which 65 percent of respondents said they support, has strong political and financial backing from Colorado's most prominent business groups as well as leading luminaries in the state Republican Party.